Off The Presses: Mad Men and Drinking, Season Four, Episode 5: Sake! Mad Men and Drinking, Season Four, Episode 5: Sake! Sake makes a splashy debut in "The Chrysanthemum and the Sword," episode five of the fourth season of "Mad Man." From the second scene, in which we learn that accounts man Pete Campbell has won Sterling Cooper Draper Pryce a shot at the Honda motorcycle company's business, you sort of knew it would. Despite Roger Sterling's objection—he fought in the Pacific theatre during World War II and has not forgiven his former enemies—Campbell, Don Draper and Eastern-leaning Bert Cooper go after Honda's business, reading up on Japanese business practices and practicing their bows. As a "modest gift" to the two Honda execs and their translator, Campbell presents them with two bottles of Johnnie Walker Black (what? no American whiskeys were available?) and, um, a cantaloupe. Oddly enough, the bottle of sake which arrives for Draper two days later is not from the Honda people (the meeting did not go well, thanks to Sterling's embarrassing race-baiting), but from Ted Chaough, the Don Draper of rival ad agency Cutler, Gleason and Chaough. CGC has been openly taunting SCDP in the press (via the advertising columnist at the New York Times) and stealing their cast-offs, like Clearasil and Jai alai. It is now competing directly with SCDP for Honda's business. The disdainful Draper calls Chaough "a fly I keep swatting away." Even though he visits Benihana early in the episode, Draper has never experienced sake. (He has his usual Old Fashioned at Benihana.) While the bottle comes from the enemy, he decides to break it open anyway in the office kitchen later one night. After struggling with the wooden box—"This is like a coconut"—he shares a glass with the firm's marketing shrink, Faye Miller. My knowledge of sake brands is limited, so I have no idea looking at the bottle what type of sake they were drinking. The bottle was made of frosted glass with cloth tied around neck. They did not drink it heated or chilled, but room temperature. Since they finished their glasses, so I guess they liked the stuff. About Benihana, the first restaurant in what would become a chain was opened by Rocky Aoki in 1964 on West 56th Street in Manhattan. So the place would have been hot news in March 1965, when this episode takes place. Don remarks that it is expensive, at least, so they must have been turning people eager to see the chefs' knife-tossing sideshows away. 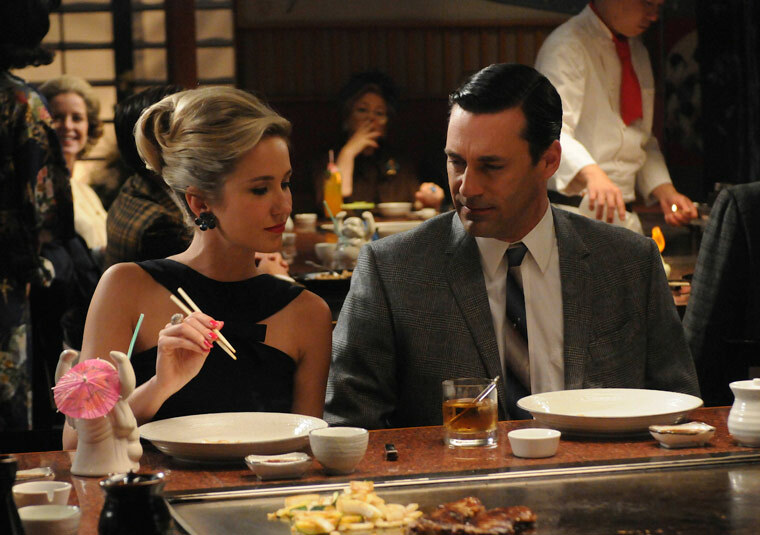 Like Draper, most New Yorkers were introduced to Japanese food through Benihana. It was the first such restaurant that wasn't geared specifically toward the Japanese-American population. Draper's increased drinking is less in evidence this episode, and his business savvy is sharp as he develops a genius strategy to simultaneously win Honda and destroy CGC. However, I have noticed that in every episode this season, someone makes a sidelong comment directly to Don about his alcohol intake. This time it was Faye Miller, who said, "I don't know how you people drink the way you do around here. I'd fall asleep." Nice, funny, tightly-packed work here by director Lesli Linka Glatter. Glatter directed last season's memorably black-humored episode "A Man Walks Into an Advertising Agency" and a couple of the crackling Jimmy Barrett shows from season two. When she steps up to the plate, you can be assured of an entertaining, quickly paced story.